Webcam Crestline, California: Crestline - Lake Gregory Drive - A view of the current traffic situation. San Bernardino, California: Caritas Communications, 6.5 mi. San Bernardino, California: San Bernardino - Glen Helen Parkway, 9.5 mi. Redlands, California: Redlands - Nevada Street, 11.3 mi. Loma Linda, California: Loma Linda - West of Tippecanoe Avenue, 11.4 mi. Colton, California: Colton - Mt. Vernon Avenue, 11.8 mi. Colton, California: Colton - West of 9th Street, 11.9 mi. Fontana, California: Fontana - North of Duncan Canyon Road, 12.3 mi. Fontana, California: Fontana - Sierra Avenue, 12.3 mi. 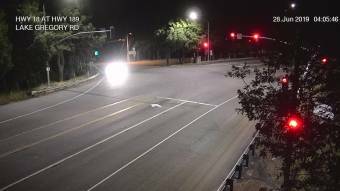 This webcam Crestline, California with the theme Traffic was added on July 19, 2012 and is operated by California Department of Transportation (Caltrans). It got 6824 visitors since then. Shouldn't this webcam work or should the link be wrong please report that here. You can add this webcam here to myCams.